Born Queen Annes County, Maryland, April 15, 1741. Died Philadelphia, February 22, 1827. Charles Willson Peale was a prolific portraitist, the creator of the first successful American museum of art and natural history, and the patriarch of an important artistic family in Philadelphia. Peale was one of the most productive painters in early America, having completed at least 771 oil portraits, 297 portrait miniatures, 29 landscape paintings, 11 still-life subjects, and 10 history paintings.1 He also made at least seven mezzotints of his portraits for wider distribution.2 Furthermore, Peale was politically involved in the Revolution and intellectually engaged in the scientific advances of his timemore so, in fact, than any other early American painter. His ambition and his position for many years as Philadelphias leading artist enabled him to paint most of the famous men of his day from life, including the first seven presidents of the United States, the explorers Meriwether Lewis and William Clark, and Benjamin Franklin. The artist was the son of Charles Peale (17091750) and Margaret Triggs Peale (17091791). The elder Charles had been a postal clerk in London but was forced to leave England after being convicted of embezzlement.3 A rectors son who studied briefly at Cambridge, he became a schoolmaster in Maryland. He died when his namesake son was just nine years old. At thirteen, the boy was apprenticed to a saddler in Annapolis, where he opened his own business after completing his indenture eight years later.4 Besides running his saddlers shop, Peale repaired clocks and watches.5 Early in his career, young Peale was assisted by some of his fathers former pupils, who belonged to the wealthy planter and professional classes in Maryland; this arrangement placed him in a social position between the skilled artisans and the economically and politically elite of his day. Figure 1. 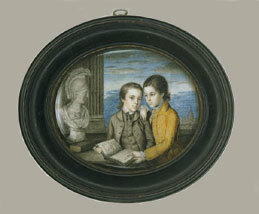 Charles Willson Peale, Matthias and Thomas Bordley, 1767, watercolor on ivory, 3 5/8 x 4 1/8 in. (9.2 x 10.5 cm), National Museum of American Art, Smithsonian Institution, Washington, D.C. Museum purchase and gift of Mr. and Mrs. Murray Lloyd Goldsborough, Jr. 1974.113. Peales early promise with the brush prompted eleven prominent Marylanders, including his most consistent early patron, John Beale Bordley (17271804), collectively to provide a subscription that financed two years of artistic training in London, from 1767 to 1769.10 In London, Peale entered the studio of Benjamin West, who instructed him in portraiture and history painting. Peales memorable works from this sojourn include a double-portrait miniature, Matthias and Thomas Bordley (fig. 1), representing the sons of his Maryland patron, and a full-length work, William Pitt (1768, Westmoreland County Museum, Montross, Virginia), from which he also made his first mezzotint. The latter image was an overblown allegory of the British statesman as a Roman senator. Pitt was understood to be a friend to the American colonies because of his leadership in repealing the Stamp Act of 1765; Peale showed him holding in his left hand a rolled-up copy of the Magna Carta and pointing with his other hand to a sculpture of British Liberty trampling on the Congress of New Yorks petition that protested the British tax.11 Both works reveal that the young artist was still struggling with draftsmanship and that he was aspiring beyond his current level of mastery. Figure 2. Charles Willson Peale, The Peale Family, 177173 and 1809, oil on canvas, 56 1/2 x 89 1/2 in. (143.5 x 227.3 cm), New-York Historical Society, New York City, 1867.298.© Collection of The New-York Historical Society. At about this time, Peale painted his most ambitious canvas to date, The Peale Family (fig. 2). That portrait shows the London-trained artist leading his brother St. George (17451778) in a drawing lesson, while his youngest brother, James, looks on in amusement. 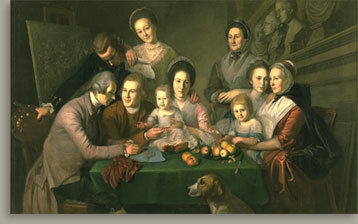 Peale has arranged three generations of the family around a table, with the pet dog in the foreground and Margaret Durgan, whom Peale described as a "nurse to all of his children," in the background.15 The underdrawing of a painting of the Three Graces is visible on the easel at left, and a shelf of sculpted busts lines the wall at right. Peale successfully linked the figures in this pyramidal composition through a flow of gazes and gestures. The painting celebrates the domestic harmony of the extended Peale family, and it positions Charles Willson as the teacher of his siblings. During the Revolutionary War, Peale became actively involved in politics as a radical Whig. He also attained the rank of captain in the militia.22 He participated in the battles of Trenton and Princeton, served on a committee to confiscate the land of Loyalists, and was elected in 1779 to a term in the Pennsylvania Assembly.23 Peale also contributed to the public spectacles that vilified Revolutionary War figures such as Benedict Arnold and the British major John André, celebrated the American alliance with the French, and ultimately commemorated victory and peace.24 Peales command of allegory, which he had skillfully employed in his 1768 portrait of William Pitt, served him well in designing and constructing a triumphal arch, replete with Latin inscriptions and an elaborate iconographic program that included a representation of Washington as Cincinnatus, the Roman soldier who refused glory and turned his sword into a plowshare at the end of war in 458 B.C. against the Aequi. That allegorical portrait was a transparency, created on varnished paper, to be hung in windows and illuminated at night by lamplight on occasions of public celebration. Figure 3. Charles Willson Peale, Thomas Jefferson, 1791, oil on canvas, 24 x 20 in. (61 x 50.8 cm), Independence National Historical Park, National Park Service, Philadelphia. As a result of his activism in the Revolution and his growing reputation as an artist, Peale was able to paint portraits of many Revolutionary War generals in addition to Washington. Those bust-length likenesses became the basis of his next enterprise: the establishment in Philadelphia of a portrait gallery in 1782 that he expanded in 1786 into a museum of art and natural history. 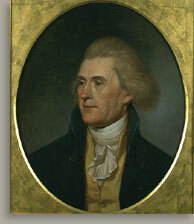 Among the finest of the portraits he made for this museum is Thomas Jefferson (fig. 3). For a work like this, Peale adopted a bust-length composition that he could complete in just two or three sittings. That format offered two advantages: it did not demand much time from the subjects, all of whom were busy public figures; and it enabled Peale to focus attention on the sitters head, the seat of intelligence and character.25 He framed such portraits with gilt spandrels, creating an oval window that emphasized the neoclassical aspect of these models of republican virtue. In 1783 he displayed in his portrait gallery a few fossil bones of a mastodon that had been recovered at Big Bone Lick in Kentucky. That exhibit inspired Peale and his sons to build an impressive art-and-natural history museum containing nearly two hundred fifty paintings and thousands of specimens. He articulated a philosophy of the public utility of museums based on their capacity to educate and amuse people, targeted his exhibitions and programs to learned and general audiences alike, organized his collections according to the principles of scientific classification, augmented the museums holdings through unceasing personal effort and by soliciting donations from the community, developed an aggressive marketing campaign, instituted subscription memberships to provide a steady patronage base, and initiated the sale of museum souvenirs.26 In each of those developments, Peale provided models that contemporary American museums of art, science, and history continue to recognize and, in many ways, follow. Peale took important steps in his private life and artistic career in the 1790s. In 1791, the year after his first wife, Rachel, died, he wed Elizabeth De Peyster (17651804) of New York City. She bore Peale six more children, including Titian Ramsay II (17991885), who became a naturalist-artist and accompanied the Stephen Long expedition to the Rocky Mountains in 1819 and the Wilkes expedition to Sydney, Honolulu, Shanghai, and Cape Town of 183842.30 Peale announced his retirement from painting in 1794, a resolve he maintained (though not strictly) until 1804.31 Elizabeth Peale died that year, and, in 1805, Peale married for a third timea Quaker woman named Hannah Moore (17551821). Among Peales sons, Rembrandt was the most capable portraitist. From 1808 to 1810 he lived in Paris, where he painted the likenesses of artists and learned men for his fathers museum. His subjects included the sculptor Jean-Antoine Houdon (17411828) and the painter Jacques-Louis David (17481825) (both portraits in Pennsylvania Academy of the Fine Arts, Philadelphia). Looking to the work of those and other artists, Rembrandt developed a French-inspired neoclassical style that was distinct from Charles Willson Peales.32 His portraits were distinguished by a much crisper modeling, harder surfaces, and brighter coloring. Meanwhile, Rubens became the manager of the Peales museum in Philadelphia, enabling his father to retire from that demanding enterprise in 1810. That year, Peale purchased a country home, which he called Belfield, outside Philadelphia, where he cultivated an ornamental and botanical garden and practiced agriculture.33 His efforts to conflate the aesthetic and utilitarian there were extensions of his approach to portraiture and museum keeping. To him, art, science, and economic production blended together naturally. Peale recorded his improvements at Belfield in a number of landscape paintings (now in various private collections), executed about 1818. Many of his portraits include landscape backgrounds, and he made landscape drawings during his travels, including watercolors during his 1801 trip up the Hudson River to excavate the mastodon bones (in the collection of the American Philosophical Society, Philadelphia). Toward the end of 1818, Peale left Philadelphia for several months in Washington, to lobby the U.S. Congress to recognize his museum as a national institution. The museum had been supported largely by admission fees, annual memberships, his familys hard work, and donations of objects. Despite his repeated efforts to obtain funding from the Pennsylvania state government, the museum remained a private enterprise. Although the U.S. government had donated minerals and Indian artifacts from the Lewis and Clark expedition to Peales museum, it, too, had refused to grant it official recognition or funds. Peale painted portraits of a number of public officials in Washington to display at the museumat least partly as a tactical maneuverbut this and his other efforts in the capital failed to yield the national institutional status he sought. Peale came out of retirement near the end of his life and helped establish the museum as a corporation with a board of directors. Figure 4. Charles Willson Peale, The Artist in His Museum, 1822, oil on canvas, 103 3/4 x 79 7/8 in. (263.5 x 202.9 cm), Pennsylvania Academy of the Fine Arts, Philadelphia. Gift of Mrs. Sarah Harrison (The Joseph Harrison, Jr., Collection), 1878.1.2. 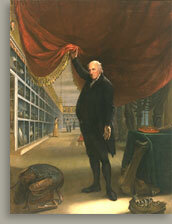 Peale summarized his achievements as museum keeper in an 1822 work, The Artist in His Museum (fig. 4).34 This full-length portrait shows the eighty-one-year-old Peale lifting back a tasseled curtain to reveal four rows of preserved bird specimens below two rows of bust-length portraits commemorating not only Revolutionary War heroes but also presidents, explorers, writers, artists, scientists, and medical curiosities. On the floor in front of Peale are the carcass of a wild turkey and the artists taxidermy kit, the tools he used to transform the thousands of birds he collected into lifelike displays of specimens in neatly framed cases lining the lower portion of the wall on the left. To the right, also on the floor, are a few bones of one of his mastodons, and behind Peale, half-hidden by the curtain, the fully reconstructed skeleton. A handful of visitors demonstrates the range of responsesfrom contemplation to wonderexpected of his various audiences. Peale died in Philadelphia on February 22, 1827, leaving behind a family of artists and adventurers. He prided himself on educating his daughters as well as his sons, but it was his nieces Anna Claypoole (17911878), Margaretta (17951882), and Sarah Miriam (18001885)daughters of his brother James who emerged as some of the first accomplished female American painters. Peales son Raphaelle broke new ground as a still-life painter; Rembrandt developed a singular style of portraiture and realized to a greater degree than his father the possibilities of history painting; Rubens advanced his fathers interests in science not only by managing the museum in Philadelphia but also by founding museums in Baltimore and New York; and Titian II, as noted, participated in scientific expeditions to the American West and beyond. 1. The count of Peales paintings is based on Sellers 1952 and Sellers 1969b. 2. Sellers 1933; Sellers 1952; Richardson 1964; Shadwell 1979. 7. Ibid., 3233; Miller 1983, 33. 10. Sellers 1969a, 50, 5362; Miller 1983, 4578; Janson-Lapalme 1991, 1127. 11. Sellers 1969a, 6671; Miller 1983, 7478. 12. Sellers 1969a, 7879, 8687. 15. Charles Willson Peale, Memoirs of Charles Willson Peale, American Philosophical Society, Philadelphia, 140. 16. Sellers 1969a, 99101; Miller 1983, 12021; and Meschutt 1999, 25. 17. Sellers 1969a, 119; Miller 1983, 167 n 103; and Meschutt 1999, 26. 18. Sellers 1969a, 16869; Miller 1983, 3024; and Meschutt 1999, 26. 19. Sellers 1969a, 27447; Miller 1992, 3233; and Meschutt 1999, 33. 20. Sellers 1952, 21641; Miller 1992, 14247. 21. Shadwell 1979, 13034, 13841, 142, 143; Reaves 1992; Miller 1996b, 2324. 23. Ibid., 128, 131, 164, 180. 24. Miller 1983, 35456, 36768, 398401. 26. Sellers 1980; Brigham 1995. 28. Ibid., 419, 42122, 459, 46062, 58891, 65354 n 6. 29. Sellers 1969a, 26873, 321; Miller 1988, 10313, 833. 30. Haltman 1996, 189, 195. 31. Sellers 1969a, 262, 317. 33. OMalley 1991; Ward 1991; Miller 1991.